One of the highlights of the spring semester was being accepted to attend the latest ThatCamp, this time here at the shore in Atlantic City at the Carnegie Library. Even more thrilling was the fact that The Richard Stockton College of New Jersey was the sponsor and host for it. I did some work with Stockton’s own John Theibault, vetting applications, and doing some general organizational work for the conference. 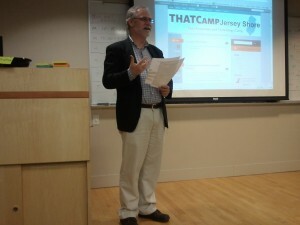 Over the next few weeks, along with NJCEA posts, I will post my notes from ThatCamp Jersey Shore. 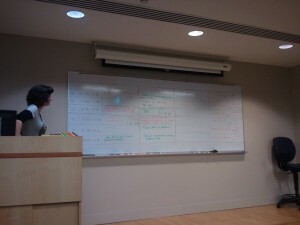 I made a point to heavily tweet my notes on the #thatcampjs hash tag. For now, however, here are some pictures. 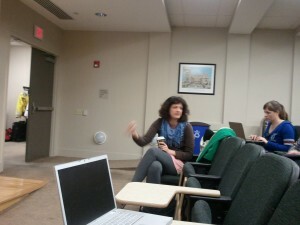 One of the biggest highlights of ThatCamp was getting to meet my internet pal Amanda French. After meeting up with John on my way in, she was the next person I saw and we greeted each other with a big hug. Amanda explained that everyone hugs at ThatCamp, which I will keep in mind, and we spent some time together while she, as a representative of ThatCamp, worked on organizing some aspects of the first day. 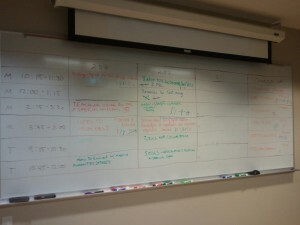 By far, the coolest aspect of ThatCamp is that the session for the conferences are completely “camper” driven. At the beginning of day one, after Amanda introduced the conference, those of us who wanted to propose a panel wrote it in one of the squares on the board. Campers then voted on which they would like to participate in or view. 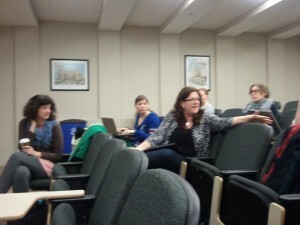 I proposed a session on using wikis in the classroom, which is something I am doing as of the spring semester. My session got, I think, the most votes, which gave me a lot of confidence heading into it. John talking to the assembled group of campers on the final day. Amanda French speaking during a session. A nice surprise at ThatCamp was running into and spending time with Deborah Gussman, my first ever literature professor at Stockton. She has gotten very interested in the digital humanities in the past few years.